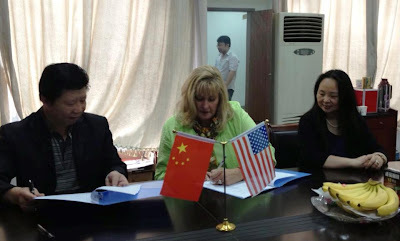 The Welcome House team at Pearl S. Buck International is celebrating today's signing of a one-on-one relationship with a Zhenjiang orphanage. The occasion is even more significant given the fact that Pearl S. Buck lived in Zhenjiang while in China. Signing ceremony at the Adoption Center of Jiangsu Province with Director Li of Zhenjiang Social Welfare Institute, Pearl S. Buck International CEO Janet Mintzer, and Director Meng of the Adoption Center of Jiangsu Province. This is so hashing news and police ought to research this mishap and check out top essay writing services uk for useful task. I feel so tragic when I heard this kind of news and turn out to be so miserable.